Monarchs continue to trickle through Cape May, and we continue to wait for a change in the weather. We are still waiting for the first big cold front of the autumn to arrive, still waiting for the first surge of migrating monarchs. In the meantime, here's a bit of what's been happening. 1. Monarch naturalist Lindsey Brendel appeared on local radio station WCFA, 101.5, on Friday morning, talking with the show hosts about the monarch migration. We love attention from journalists, whether from the press or broadcast media. 2. 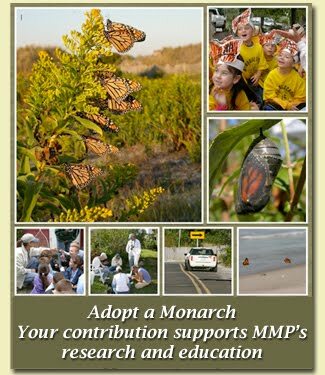 Twelve enthusiastic participants joined MMP Director Mark Garland for the first ever full day CMBO Monarch Butterfly workshop on Thursday. 4. Our regular education programs continue, with "drop-in" programs every morning at 11 am at Cape May Point's Triangle Park through Oct. 19; tagging demos at 2 pm every Wednesday, Friday, Saturday, and Sunday at Cape May Point State Park, and "Tank Talks" at the CMBO Northwood Center on the next two Fridays, Sept. 30 and Oct. 7. Monarch Monitoring Project Naturalist Diane Tassey captivates the audience and one of our tagging demos.